When Mark McShane told me about this rare bird (discovered by Patty McLean and Kathy Miller on 12/13/09), I did not pay too much interest about this bird. I checked my Peterson's Field Guide at that time and found out it was a sparrow sized bird. It much looks like a nonbreeding Savannah Sparrow with a difference of about an inch longer than Savannah Sparrow. Mark went ahead to chase Lapland Longspur afterwards and he saw 17 plus of these birds. Later, I regretted that I did not join him that day (<------ photo shown to the top left is a breeding Male). 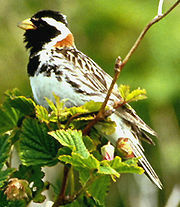 Lapland Longspurs are Arctic nesters. They breed at different areas of the Arctic Europe, Asia and in Canada and the northernmost of United States. Lapland Longspur is also sexually dimorphic (most of sparrows are not sexually dimorphic). During the breeding season, male has black head, face and throat, reddish brown nape, white eyestripe, white belly and heavily streaked black-grey back. Female lacks black head, face and throat of male but with rusty nape. In winter, they flock in a large group and migrate to the great plains of southern Canada through northern Texas. During this time, they feed on the waste grain in open, agricultural fields. They often can be found with a flock of Horned Larks. It is very uncommon to the eastern part of North America in winter. When I searched the eBird data, it showed the last time Lapland Longspurs were spotted in Georgia was on February 17, 2006. Now I realize what an opportunity I have missed and I decide to chase Lapland Longspurs before they leave Georgia. It was not a pretty Saturday with heavy clouds and drizzles, A friend and I decided to drive to Smith Sam Park/Senior Aquatic Center (1155 Douthit Ferry Rd, Cartersville, GA 30120) in Bartow County where Lapland Longspurs were first spotted on last Saturday. When we arrived at the park, we ran into Patty McLean and her two friends, John and Nancy, they too also drove all the way from south of Savannah (5 hours driving time from Bartow county) to here to chase these rare seen Lapland Longspurs. I suddenly felt we were not the only ones passionate about these birds. Patty was very nice to stay with us in a windy, coooooooooold Saturday afternoon after John and Nancy taking off. With Patty and her spotting scope’s help, we quickly found six or seven Horned Larks with both types of "Prairie" (which breeds in southern Canada and the eastern U.S, has white eyebrows and pale-yellowish throat) and "Northern" (which breeds in most part of U.S., is much darker and with yellow eyebrows and throat) species foraging on the ground which was located just left side of the main road to the park. We drove back and forth near the parking area and did not have any luck due to many walkers with dogs and that intended to scare these birds away. Again, we found two more Horned Larks with no sign of Lapland Longspurs. After about an hour, it got really dark at around 4 PM and we could not stand the chilly wind any longer. Suddenly, we heard several chipping notes and then saw a flock of birds about 20 flew over our heads. Patty identified them as Lapland Longspurs. Patty did see 4 of them in the morning with John and Nancy and it was hard for us to get a good visual in the late afternoon.